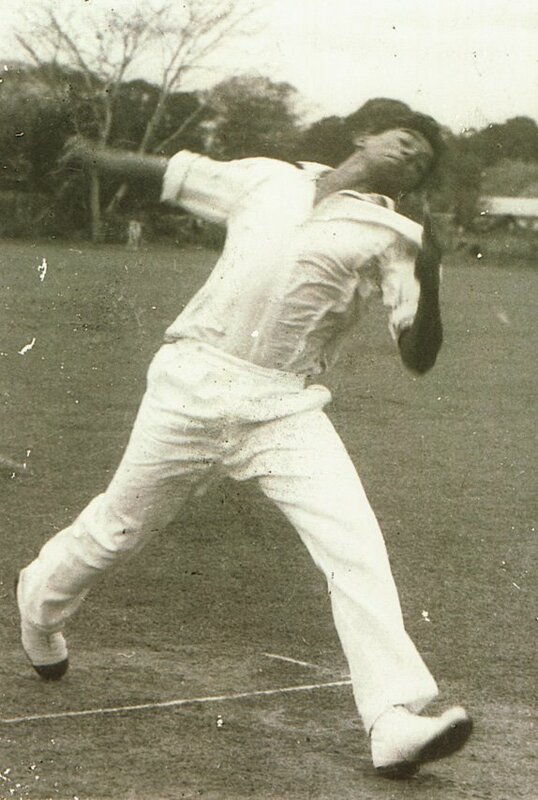 In the 1962-63 season under the leadership of Premaratne (ex Anthonian and first schoolboy cricketer of the year in 1956) and with Darrell Lieversz leading the attack, backed by fast bowlers such as Franklyn Burke, Saliya Dorenagama and Samsudeen, Colts was a force to be reckoned with. If the umpire had lifted his finger at one of the many pad ups of the university batsman during the crucial last game, Colts would have won the competition. In the early eighties Dickie Alles showed me cuttings of that season and agonised over what might have been. I guess that I would have felt the same if the last Thomian pair had held out in 1969. 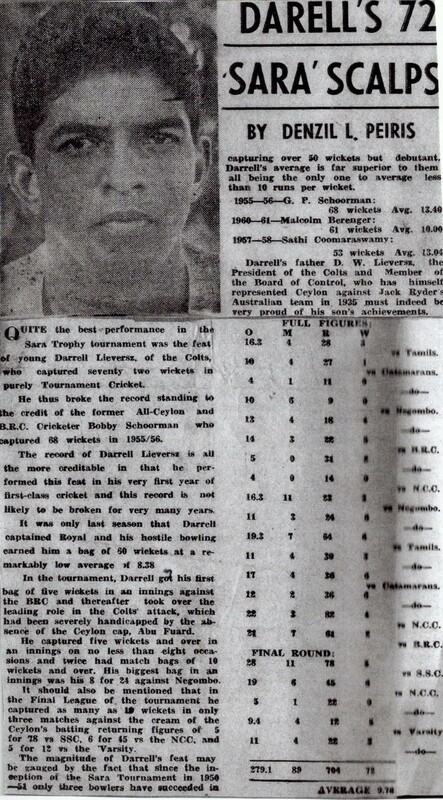 At the completion of the 1962-63 cricket season Denzil L. Peiris wrote an account of Darrell’s performance with the ball which he titled “Unique record by Lieversz” and the article appeared in either the Daily News or Observer along with a picture. The author sent a copy to the secretary of the club along with a covering letter dated 29th April 1963 with an address of the Bank of Ceylon. The article is damaged by water and I decided not to scan it. The article went as follows – “Quite the best performance in the Sara Trophy Tournament was the feat of the young Darrell Lieversz of the Colts who captured seventy two wickets in purely tournament cricket. He thus broke the record standing to the credit of the former All-Ceylon and BRC cricketer Bobby Schoorman who captured 68 wickets in 1955-56. The record of Darrell Lieversz is all the more creditable in that he performed this feat in his very first year of first-class cricket and this record is not likely to be broken for very many years. It was only the season before that Darrell captained Royal and his hostile bowling and shrewd leadership enabled his College to finish second to Wesley in the unofficial School championship. He also had the honour of leading the bowling averages with a bag of 60 wickets at a remarkably low average of 8.38. No indication: The performance of Darrell during the early part of the tournament gave no indication as to his real bowling capabilities for he captured only eight in the first four matches as against the twenty nine captured by his club mate Sali Dorenagama. He got his first bag of five wickets in an innings against the BRC and thereafter took over the leading role in the Colts attack which had been severely handicapped by the absence of the “Ceylon” cap Abu Fuard. He captured five wickets and over in an innings on no less than eight occasions and twice had match bags of 10 wickets and over. His biggest bag in an innings was his 8 for 28 against Negombo. It should also be mentioned that in the Final League of the tournament he captured as many as 19 wickets in only three matches against the cream of the Ceylon’s batting returning figures of 5 for 78 vs SSC, 6 for 45 vs the NCC, and 5 for 12 vs the Varsity. Far superior: The magnitude of Darrell’s feat may be gauged that since the inception of the Sara Tournament in 1950/51 only five bowlers have succeeded in capturing over 50 wickets but debutant Darrell’s average is far superior to them all being the only one to average less than 10 runs per wicket. Darrell’s father D.W.L. Lieversz, the President of the Colts and member of the Board of Control, who has himself represented Ceylon against Jack Ryder’s Australian team in 1935 must be indeed be very proud of his son’s achievements. It is indeed a pity that no foreign teams are due in Ceylon this year, for if a Ceylon team were to picked now, Darrell would be an automatic choice to represent his country and emulate the feat of Channa Gunesekera who followed in the footsteps of his distinguished father Dr. C.H. Gunasekera in getting a Ceylon cap. 16.3-4-28-3 vs Tamils; 10-4-27-1 and 4-1-11-0 vs Catamarans; 10-6—9-0 and 13-4-18-4 vs Negombo; 14-3-22-5 and 5-31-2 vs BRC; 4-0-14-0 vs NCC; 16.3-11-23-3 and 11-3-24-8 vs Negombo; 19.3-7-64-6 and 11-4-39-3 vs Tamils; 17-4-36-6 and 12-2-36-6 vs Catamarans; 22-3-82-4 vs NCC; 21-7-61-2 vs BRC. Two other articles appeared on the same topic. 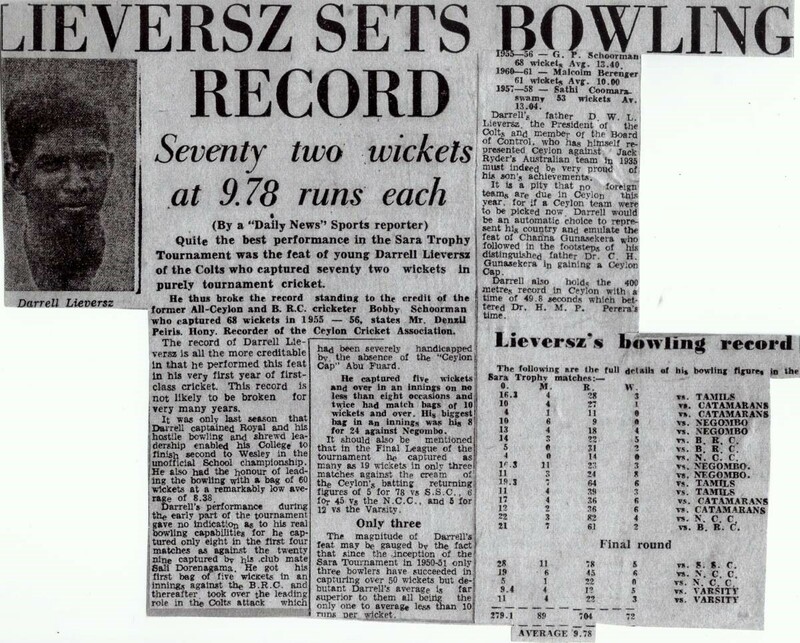 One article titled “Lieversz sets bowling record” appeared in the Daily News and is attributed to “Daily News” sports reporter who is likely to be Denzil Peiris. The other was by Denzil L. Peiris. entitled “Darell’s 72 Sara Scalps” carries identical information to his article which I have transcribed above, but is different format.